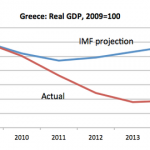 25 juni 2015 – In the New York Times Opinion Column, Paul Krugman, the Nobel Prize-winning Op-Ed columnist points out, that “the people who utterly failed to see the damage austerity would do — see the chart, which compares the projections in the 2010 standby agreement with reality — are now lecturing others on growth? Furthermore, the growth concerns are all supply-side, in an economy surely operating at least 20 percent below capacity. austerity, Economie, Eurocrisis, Grexit, Griekenland, IMF, onderhandelingen, Trojka. Bookmark.